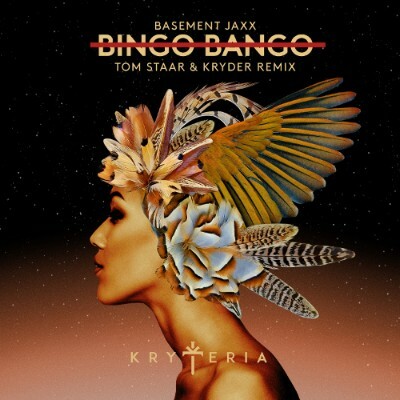 After focusing on original compositions for the first two Kryteria releases, launching alongside Steve Angello with ‘Romani’ before teaming up with Colombian Cato Anaya on ‘La Cumbiambera’, Kryder drafts in long-time production partner Tom Staar to remix Basement Jaxx’s ‘Bingo Bango’, originally released on their debut album ‘Remedy’. The duo have had previous collaborative efforts coming in the form of remixes for the likes of Armin Van Buuren as well as originals on labels such as Spinnin’, SIZE and the pair’s label Cartel. The remix brings the original into 2018, maintaining the charm of the original with the infectious “bingo bango” vocal and piano midsection while bearing Kryder and Tom Staar’s house grooves. The Latin influences of the original are kept intact, complemented by tribal rhythms that ensure the remix is primed for the dancefloor, and bring the track to the present day in the process. With support on previous collaborations coming from a broad spectrum of names such as Steve Angello, Hardwell, David Guetta, Axwell, ARTY, Martin Garrix and Annie Mac, look out for this remix in the coming months as Kryteria aims to go from strength to strength.